David agrees to take Eve's case. Daphne is upset when her mother fails to put in an appearance. Pippa and Ben get engaged. Daphne is told the tests are over, so she doesn't have to go back to the hospital: the doctors report agrees she has a hormone imbalance and she is to get progesterone treatment. Ben meets David Adams for lunch and offers Eve's case to him, but he has scruples about taking on cases he doesn't "believe" in. At an eventful mail call, Lexie gets a letter from Marlene and reads it out, despite the fact that few of her audience will have heard of Marlene, and Nora gets a birthday card - from her mother, who she hasn't heard from for many years. Joan confronts Terri at work: Terri reiterates that their relationship is over and Joan realises that Terri's boss Barry doesn't know about them. Ann warns Ben that she can't allow him to hurt Pippa, even while she agrees that Pippa does need to be taught a lesson. Terri and Joan go for a walk: Terri tells Joan she thinks she is a "weak gutless old woman crawling to her and begging" and that Joan has changed so much she can no longer respect her. Ben tells Daphne her mother is coming to see her: Daphne's face falls as she thought her parents had rejected her. David visits Eve. Lexie is obnoxious to everyone in the laundry. Eve turns on the charm and the tears for David's benefit, and he appears to believe her and agrees to take up her case. May is the only one who knows about Nora being contacted by her mother, but tells her the other women will soon notice how pre-occupied she has become. Pippa delivers some teeshirts for Lexie to do her designs on. Eve attends the class and finds out from Pippa about David's broken marriage. Joan ignores Terri when she knocks on her door begging to be taken back after Barry has rejected her. Pippa tells Ann she's going back to London as she doesn't think Ben is interested in her. Eve gets a hard time from Lou about being a kept woman, and the other women are pretty unsympathetic at her lack of concern for her lover's wife and children. Ann warns Ben about Pippa's travel plans. Joan seems to be back to her usual self at work and threatens to thump Daphne when Lou pushes her so she collides with Joan. Meg's attempts at sympathy reduce Joan to tears. Lou finds her sobbing in a corridor and taunts her . Meg sees Joan hit Lou, but covers for her. Ben checks the airlines and finds that Pippa hasn't booked a flight. Meg tries to urge Joan not to bottle up her emotions and dredges up some soothing cliches along the lines of "time heals all wounds". None of the women believe Lou's story of Meg backing up Joan. Meg asks Ann if she can send Joan home as she is too upset to deal with the women. Meg denies it when Nora faces her with Lou's allegations: Nora agrees to lie to the women, but says she reckons Meg owes her a favour in future. Pippa comes back home and tells Ann to phone Ben and get him to come over. Joan gets a call from Cynthia demanding to meet her immediately. Daphne is disappointed a second day running when her mother fails to visit. Ann tricks Ben into admitting that he is in love with Pippa so that Pippa can swan in, look smug and anounce they are engaged. Joan meets Cynthia in an underground car park: as usual we do not see her face, but only one (scarred) hand on the steering wheel . 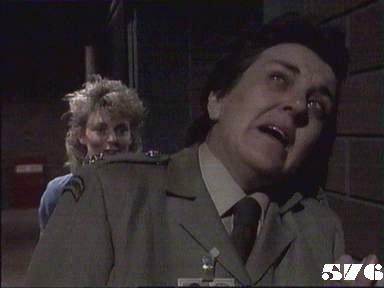 Cynthia tells Joan that Reb Kean is to be transferred to Wentworth after being beaten up and hospitalized, and Cynthia wants her dead. Big day for Tina Murray: she get two letters at mail call, and mutters "Thanks, Mrs Morris" in gratitude. Brodie's name is also called, but the recipient is off camera, so we can't see who is meant. Lou's allusion to "Whelan the Wrecker" (her nickname for Eve as a marriage wrecker) is puzzling to UK viewers at least. From a couple of references on the Internet, it appears Mr Whelan made his name and fortune in salvage (particularly from shipwrecks?) in the Thirties and Forties. Presumably the Nick Cave song of the same name refers to the same person.